We love ethnic food in our house and since transitioning to a predominately vegetarian diet, we love it even more! So many ethnic dishes are already tailored towards plant-based eating. This dish was inspired by the Peas and Thank You recipe Szechuan Broccoli and Quinoa. I made a few minor adjustments to the sauce and added several ingredients to make this a main-dish meal for us. It's so tasty that I've made it twice in the last week! And the leftovers are delicious too! Feel free to substitute your veggies of choice, just adjust cooking times as needed. Don't let the long list of ingredients and instructions deter you from trying this. Once you get your veggies prepped, this meal comes together quite quickly. Cook the quinoa or brown rice according to package instructions. Cut the tofu into cubes. Lay a clean towel on a cutting board and place the tofu on top. Either fold over that towel to cover or lay a second towel on top. Place another cutting board or baking sheet on top and stack a few heavy items to create a tofu "press." (Cookbooks work well.) Leave the tofu to press for 30-60 minutes. Arrange mushrooms and onions on a medium baking sheet and drizzle with a little sesame oil or olive oil; if desired, sprinkle with a little salt, red pepper flakes, and garlic powder, if desired. Arrange pressed tofu cubes onto another medium baking sheet, drizzle with a little sesame oil and tamari sauce; if desired, season with a little salt, ginger powder, garlic powder, and red pepper flakes. Arrange broccoli florets on a large baking sheet and drizzle with a little sesame oil. If your oven size allows, broil the mushrooms and onions alongside the tofu for 10-15 minutes, stirring once. Then place on the bottom rack to keep warm while you broil the broccoli for 6-9 minutes, stirring once and making sure not to burn. While the veggies and tofu are broiling, make the sauce. In a small saucepan, combine all of the sauce ingredients. Bring to a boil over medium-high heat, stirring constantly. Lower heat and simmer for a minute or two, until thickened. Remove from heat. 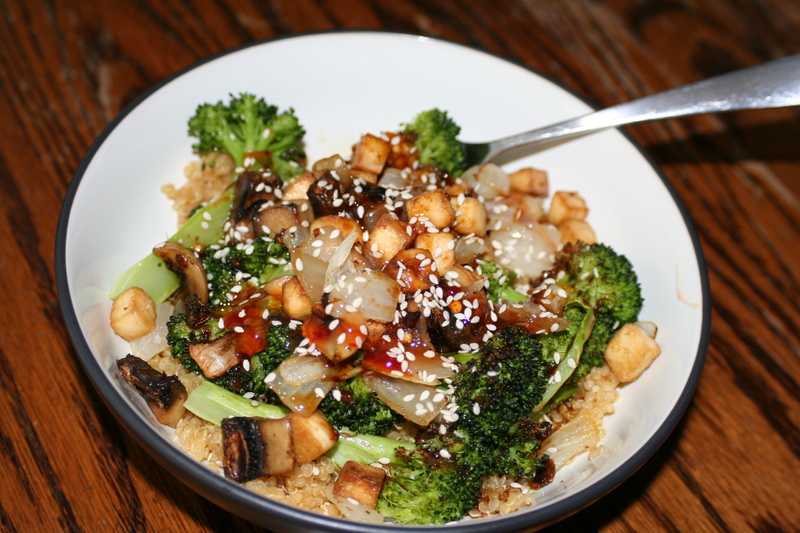 Scoop quinoa or rice into each bowl, top with the roasted veggies and tofu, drizzle with the sauce and sprinkle sesame seeds on top. Yum! I'll be making this soon. After I originally left a comment I seem to have clicked the -Notify me when new comments are added- checkbox and now each time a comment is added I get 4 emails with the exact same comment.